The Arabic word ‘azeem is originally used to describe anything of a big stature. If eyesight fails to catch the end or the limits ofsomething, then it must be greater than anything which can be caught byeyesight. Accordingly the sky is greater than the earth and the earth isgreater than a mountain; the sky can not be encompassed by the field ofvision yet the brain can gauge its dimensions. 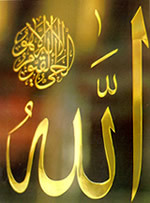 Allah is the SUPREMEWho is greater than everything, can not be grasped by eyesight and cannot be perceived by mental faculties; He can never be seen by the eye,and the mind can never form a mental image of Him; He challenged and crippled mental faculties that can never perceive Him and surpassed the utmost attainment of the mental abilities; He possesses the highest grades of Honour and Glory,and is never in need of a helper. His Supremacy has never been marked byan initiation nor His Glory will ever have a termination, Praise and Glorybe to Him, He is Allah.